The Pressure Vessel Certification article provides you with information about the ASME stamp holder process for manufacturers and third party inspection companies. Do you what the pressure vessel certification process is? Do you know how pressure vessel manufacturers can be ASME stamp holders? How Third Party inspection companies can be certified by ASME and be Authorized Inspection Agencies? What is a “U” stamped pressure vessel? This article describes all the required information regarding pressure vessel certification and regulation. You may know pressure vessel manufacturer certification is the same as authorization for an ASME Stamp. The pressure vessel manufacturers can implement an ASME Quality Control System and then apply for the ASME Stamp. This means that if a manufacturer is accredited by the ASME organization for pressure vessels per ASME Code Section VIII Div. 1, they can stamp the letter “U” in the pressure vessel nameplate. The ASME Training Course is 5 days video training course and available online and the student that successfully pass the exam, receive I4I academy certificate with 40 hours training credit. Authorized inspection agencies are third party inspection companies, which have accredited by an ASME organization and their inspectors are certified by the National Board Inspection Code (NBIC). These inspectors are named authorized inspectors and hold commission cards issued by NBIC organization. Summary: AIAs are accredited by ASME, but these inspectors are certified by NBIC. 5. Describe a QC-System according to the ASME code quality control manual and have the procedures prepared by the manufacturer. A representative demo pressure vessel needs to be constructed and all drawings, calculations, part lists, purchase orders, material test reports, fabrications, inspections, tests and reporting shall be based on ASME code section VIII requirements. Quality control procedures and personnel also need to be approved by the manufacturer. It takes almost 4 months to fulfill the above requirements. Then an audit needs to be conducted by a supervisor authorized inspector, which is designated by an authorized inspection agency, which is under contract with the manufacture. This auditor would report non-conformities found in the audit process, and then the manufacturer would have some time to correct them. Finally, the audit would be conducted by an ASME designated person, supervisor authorized Inspector and authorized inspector. That is the reason this audit is named a joint review. 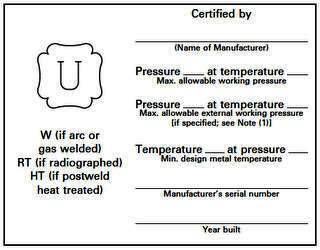 If the result of Audit was satisfactory, the certificate would be issued by ASME and then manufacture would be authorized to stamp name plate with “U” Stamp. What are the Different Pressure Vessel Stamps? What is the Quality Control System that Needs to be Implemented in Pressure Vessel Certification? For U the stamp, the quality control system needs to be based on ASME section VIII Div. 1 Appendix 10. What is the Benefit for a Pressure Vessel Purchaser to Order a Stamped Pressure Vessel? When a purchaser orders stamped pressure vessel from a stamp holder manufacturer, it is not necessary to hire a third party inspector. Because this pressure vessel would automatically be inspected by an AI(Authorized Inspector) and its data report would be signed by him. Another benefit can be the purchaser's assurance of the quality of the pressure vessel, because of the manufacturers responsibility to the ASME organization. At the same time, ordering a stamped pressure vessel would be more expensive than a non-stamped pressure vessel.